My sweet baby girl turned one this month. I still can hardly believe this first year with her has already come and gone. For her first birthday party, we decided to go all out rainbow. My main inspiration for her first birthday party came from a term that is used with great hope and love in the infertility community... rainbow baby. A rainbow baby is the first baby you are able to give birth to, to hold after the loss of a previous pregnancy or little one. Baby girl is our rainbow baby after two previous consecutive miscarriages. For baby girl's party, I created a rainbow bundt cake, a heart shaped layered smash cake, and also baked extra rainbow swirled cupcakes when I realized my guest count was a *a little* higher than I had originally anticipated. The bundt cake will serve about 12-15. I made about 18 cupcakes as well. If you plan to make cupcakes, just pick up another box of cake mix & double the recipe. But if you are having a smaller party, the bundt cake should be sufficient. In a large bowl, mix together the cake mix, eggs, water, oil, and sour cream. Divide the batter into 6 different bowls- putting the most batter in the first one and then progressively putting less in each bowl as you divvy it out. Now color each of your bowls of batter with your food coloring. I did yellow, orange, red, purple, green, and blue. I added a few drops at a time until I had the color that I was going for. Be sure to grease and flour your bundt cake pan and your heart shaped pans. After you have your smash cake layers poured, start with the layering of your batter for the bundt cake. I started with my red since it was the batter I had the most of and poured it into the bottom. Then I layered all the other colors in. I do suggest that you make sure you pour each of the colors of batter from the outside in so that the rainbow layers also show up on the outside of the cake. 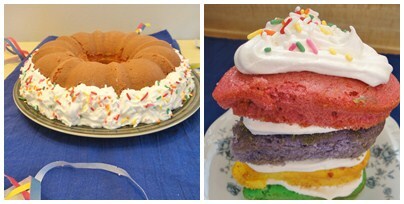 I found a lot of helpful tips for layering the rainbow bundt cake batter from this post on Shane's Killer Cupcakes. You will bake the bundt cake for about 35-40 minutes. After 30 minutes or so, check the cake with a toothpick. When the toothpick comes out clean, it is done. The heart shaped cakes took about 20 minutes to bake. Let the cakes cool for about 10 minutes in the pans, and then turn them out on wire racks to cool completely before frosting. If the cakes won't come out very easily at first, just work a butter knife along the outer edges of the cakes & then try turning them out again. I had an idea in my head that I wanted the frosting on the bundt cake to just run along the bottom so that it would look like clouds at the end of the "rainbow" when you cut into the cake. I needed a buttercream that was fluffy, but that was stiff enough to not slide down. I remembered seeing a recipe for a Marshmallow Buttercream on Shaken Together that she had used on Rocky Road cupcakes, and I knew it would be perfect! Just cream the butter and sugar together. Then hand stir in the marshmallow fluff and vanilla. I simply used a pastry bag & decorative frosting tip and piped the buttercream in 2 thick layers, one right on top of the other all along the bottom of the bundt cake. I then carefully tossed on rainbow sprinkles all around on the "clouds". For the rainbow smash cake, I used the same frosting tip and simply piped heart shaped dollops of buttercream between each heart shaped cake layer, and then put a pretty dollop on top with a dash of rainbow sprinkles. If you opted to make cupcakes in addition to the bundt cake and smash cake, this frosting recipe is almost enough for all of them. I actually had 3 cupcakes that were not frosted because I ran out of the buttercream. But they were not actually needed for the party, so no biggie. I couldn't wait to cut into the rainbow bundt cake to see how it looked on the inside! It turned out beautifully even if they colors were not perfectly rainbow layered. YUM!!! I love the colorful cakes. This is a great idea for Easter. I loveee the smash cake! so cute! And the bundt cake turned out beautifully! Oh!! So happy I found your blog and this post! My youngest son is turning 2 in a couple of weeks and I've been looking for a fun cake to make for his birthday - I think I just found it!! Thanks for sharing! It is darling and looks delicious!! Pinning and making!! Great ideas! My youngest girl is turning one this month and I need to decide what to do for a smash cake. We have the real cake all ordered from a local artist, but the smash cake isn't included as if I'd purchased it from the grocery store... that means I'm going to have to get creative, I guess. Thanks for the inspiration.